The Mapfre Foundation has become in recent years a benchmark in the national exhibition scene. 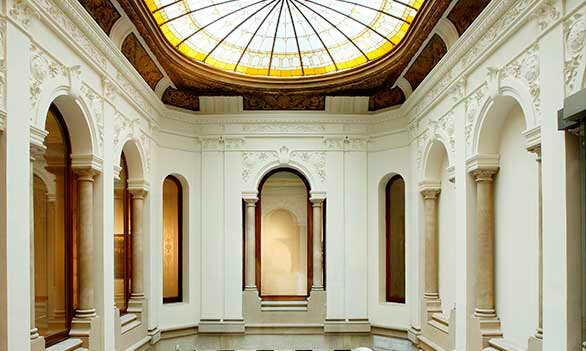 The Sala Recoletos, in Madrid, is focused on exhibitions of plastic arts from the period from the final third of the 19th century until after the end of World War II, in addition to the permanent exhibition “Espacio Miró”. The Sala Bárbara de Braganza, located on the Paseo del Arte in Madrid, is dedicated to photography and annually programs four photography exhibitions of recognized masters and contemporaries. In Barcelona, the Sala Garriga i Nogués – the former headquarters of the Godia Foundation – was inaugurated in October 2015 with the exhibition “The triumph of color, from Van Gogh to Matisse”. MagmaCultura manages the reception service, visitor assistance and guided tours of the Sala Recoletos and Bárbara de Braganza of the Culture Area of Fundación Mapfre. Since the inauguration of the Sala Casa Garriga i Nogués, MagmaCultura collaborates with the Mapfre Foundation, conceptualizing and carrying out the guided visits and educational workshops, as well as the management of audiences in this space.